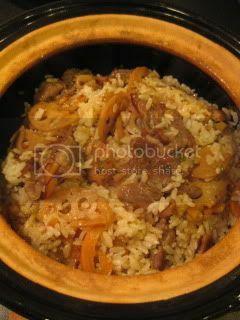 With tender juicy Kurobuta pork and crunchy lotus root, this donabe rice dish can be a very satisfying main dish. 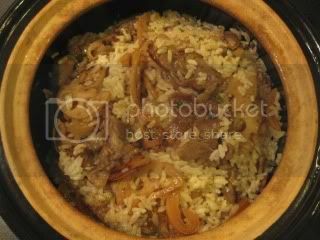 You cook slightly-firm rice with double-lid donabe rice cooker, "Kamado-san", then just mix in the sautéed pork and lotus root, which was seasoned with oyster sauce. In Kamado-san, combine the rice and water. Let the rice soak for 20 minutes. In a bowl, combine the pork, salt, pepper, potato starch, and sake, and mix well by hand. Cover and refrigerate for 20-30 minutes. In another small bowl, combine the ingredients for the sauce and set aside. Cover Kamado-san with both lids and set over medium-high heat over gas stove. Cook for about 15 minutes. Turn off the heat and let Kamado-san rest for 20 minutes. Meanwhile, heat the sesame oil in a sauté pan over medium-high heat. 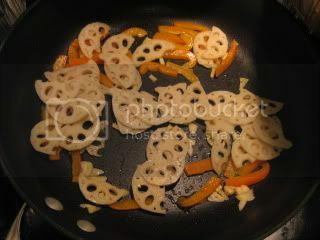 Add the garlic, lotus root, and bell pepper. Stir-fry for a couple of minutes. 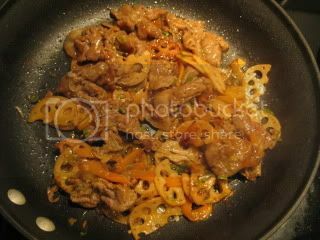 Move the vegetables on one side of the pan, and add the marinated pork to the empty side of the pan. Stir-fry until the pork is almost cooked through. Add the sauce mixture and stir-fry with all the ingredients in the pan for a couple of minutes. Add the scallion and quickly stir again. Remove the pan from the heat. When the rice is ready, uncover both lids, and add the cooked meat and vegetables. Fluff gently with a spatula until the rice is nicely mixed with the meat and vegetables. Serve immediately.